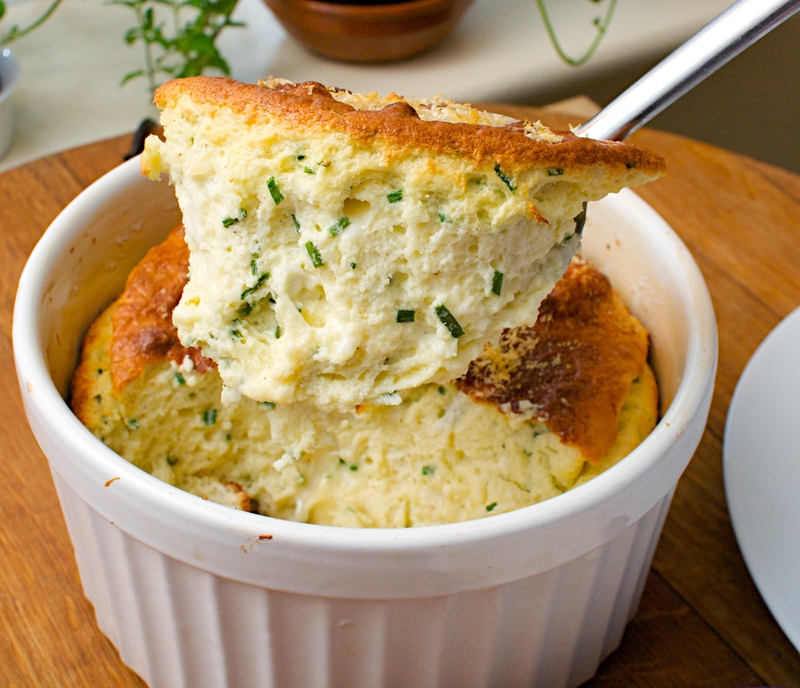 Soufflés are not that hard to make despite their intimidating reputation. Maybe try it yourself first before serving at a dinner party, just in case. 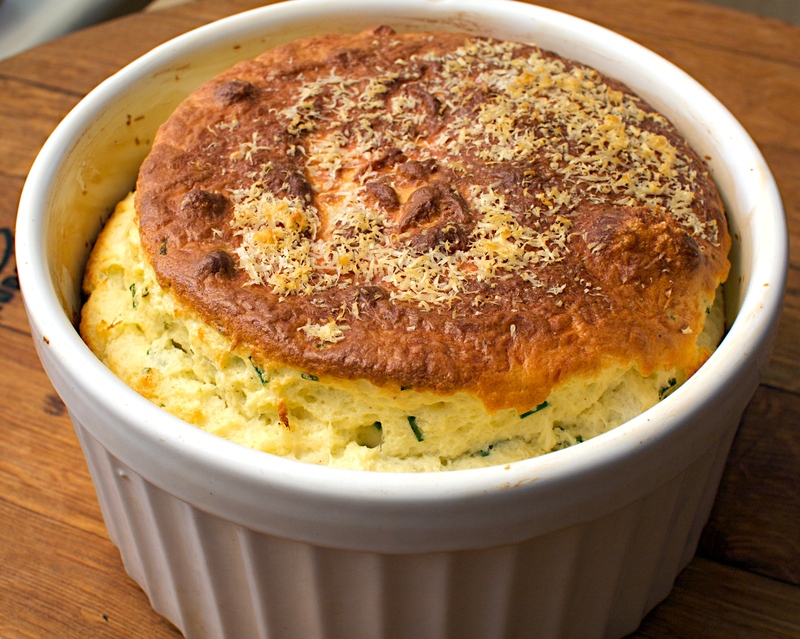 Ideally you need a 2 pint soufflé dish (ours was a bit bigger and it still turned out great – it just won’t rise up above the rim of the dish as much). Tastes fab! Put a heavy baking tray on the shelf below the centre of the oven and preheat the oven to 190C/fan 180C/gas 5. Grease the inside of a soufflé dish with some soft butter. Put the egg whites in a large clean bowl, and the yolks in a small bowl. Finely chop the goat’s cheese. Put the milk into a large saucepan, then add the bay leaf, butter and sprinkle in the flour. Put the pan over a medium heat and whisk vigorously continuously until the milk comes to the boil. Once the sauce bubbles and starts to thicken, continue to whisk for a further minute until it is very thick, then remove from the heat. Throw away the bay leaf. Stir in the goat’s cheese and Parmesan, keeping 1 tbsp Parmesan. The mixture will look pretty lumpy but don’t worry about this. Stir in the egg yolks, one at at time. Snip in the chives using a pair of scissors, then season with salt and pepper. Stir well and set aside. Whisk the bowl of egg whites with an electric mixer on high speed for 2-3 minutes until they stand in soft peaks. You should be able to hold the bowl upside down without the eggs sliding out. Careful not to whisk them past this point. Use a wooden spoon to stir two spoonfuls of the egg whites into the cheese sauce in the pan. Use a spatula or large metal spoon to gently fold the remaining egg whites into the cheese sauce until they are evenly mixed in. Take your time and stop when a few streaks of egg white are still visible. Pour the mixture into your soufflé dish and sprinkle with the remaining Parmesan. Run your thumb lightly around the inside edge of the dish to make a deep groove in the mixture. Gently place onto the hot baking sheet in the oven and cook for 35-40 minutes, until risen and golden. Shake the soufflé gently to check if it is cooked, if it wobbles a lot, bake for another 5 minutes. Serve straight away as it doesn’t keep! Wine Suggestion: We suggest trying a rich, mouth-filling white from the northern Rhône. Try a Condrieu made from Viognier, or for something a little different we highly recommend Pierre Gaillard’s St Joseph Blanc made from 100% Roussanne. I live in fear of soufflé. One of these days I will be brave enough to try it. It it works, I will post about it in a blasé style. If it doesn’t, you will hear nothing about it. Looks delish! I know that soufflé is really hard to make!!! I’m definitively going to try it!